By using latest special mechanism design,YS-12 use the hydrodynamic water fragmentation，producing very fine water mist，with the speed of sound (360m /s) to form a strong momentum jet to the nozzle and form a continuous energy field on the top of nozzle，crushing the dirt on the surface or internal of Nozzle ，during the cleaning process the cleaning liquid ( DI water) can be achieved automatic direct emissions, not need cleaning solvent at all. Clean: 12 nozzles at one time. it can clean all types of nozzles by using different nozzle trays. Compressed air blow to make nozzles dray. Check: Standard equipped nozzle inspector. 2. Replace traditional manual clean, avoid troubles caused by ultrasonic cleaner, reduce rejection rate. 3. To clean the dirt completely which ultrasonic cleaner can not deal with. 4. cleaning result will not affect by the smaller and smaller nozzle. 5. Thoroughly clean 99% dirt on nozzle, extend the lifespan of nozzle. 6. 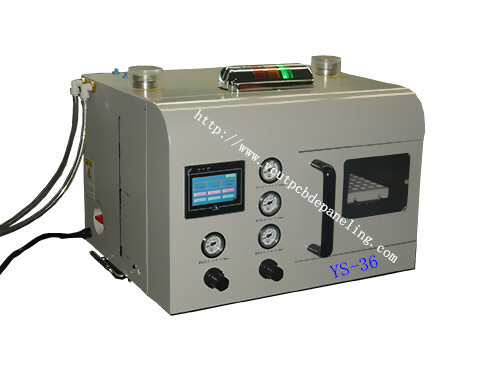 Protect the coating surface of nozzle and its reflection panel. 7. No solvent, only use environmentally friendly DI water or purified water . 9. Applicable to all kinds of Mounter nozzles.